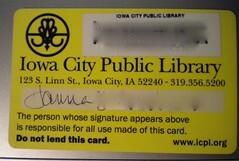 Bezzie has requested that we post pictures of our library cards. And on mine, you get to see my bad handwriting, too, although in a pique of uncharacteristic paranoia, I've blurred out part of my signature, in addition to my card number and barcode. And I promise -- knitting next time! Wow that looks a lot like my Bloomfield one! Much more interesting swirly logo though! Bright! Gotta be easy to find in your wallet.